The area along the shores of the Potomac River has been a bustling center of trade and commerce since the earliest European exploration of North America. Captain John Smith sailed up the river in 1608, and his accounts, along with those of subsequent pioneers, attracted many settlers to the region. One such settler was Cadwalder Jones, a British trader and mapmaker, who established a cabin in 1699 along the Potomac River at a spot that would later be named Jones Point in his honor. Around this time, lucrative tobacco crops were beginning to take the place of animal pelts as the primary driver of the economy, just as one hundred years later wheat fields would supplant tobacco as the most profitable venture. Besides being an important export crop, wheat also led to the development of mills and bakeries in the fledgling town of Alexandria. The busy ports of Georgetown, Washington City, and Alexandria formed the backbone of commerce and industry along the Potomac, prompting a request for a lighthouse on Jones Point to warn ships traversing the river of dangerous sandbars. In August 1852, the Lighthouse Board received a Congressional appropriation of $5,000 to purchase land and erect a beacon at Jones Point. Three years later, the money was used to purchase a tract of land measuring 30 by 100 feet from the Manassas Gap Railroad Company for $501. The land included one of the original District of Columbia boundary stones, which was installed by George Washington and marked the southern point of the ten-mile-square district. The stone is still visible today in the seawall just south of the lighthouse, and to the north of the lighthouse a marker designating the boundary between Maryland-Virginia can be seen. 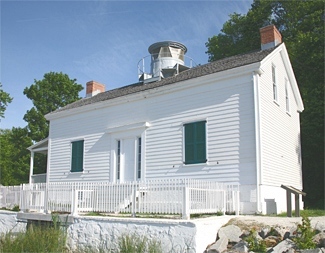 First lit on May 3, 1856 by keeper George L. Deeton, the lighthouse consists of a rectangular clapboard structure that sits atop a brick foundation and has a circular lantern centered atop its pitched cedar roof. A porch that extends across the western end of the dwelling has an entry door, but the actual front door is larger and located on the south side, facing the river. 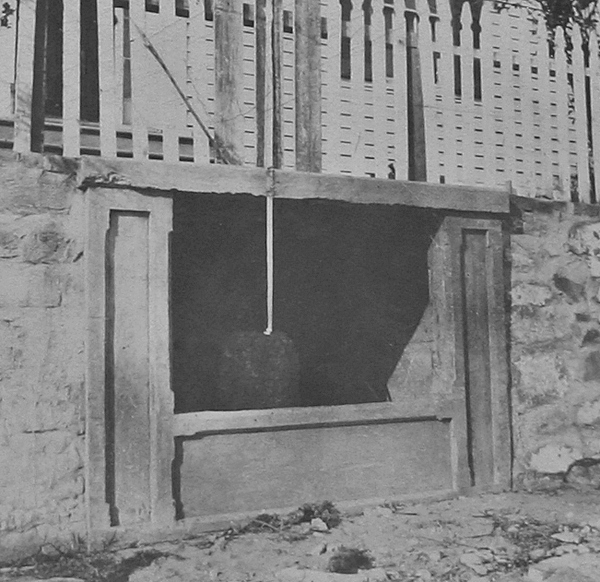 In the lawn near the porch is the six-foot-square masonry foundation of what was a well. Inside on the main floor, a central hallway originally divided the space into two large rooms, each containing a large brick fireplace. In the middle of the hallway a hatch door leads to the basement, which contains two large rooms with brick floors. Fireplaces also adorn these spaces and are positioned directly underneath the main floor hearths so they can use the same chimneys. Above the main floor is one large room topped by a pitched dormer-style ceiling. A ladder ascends through this ceiling up to the barrel-shaped lantern room, which features ten trapezoidal windows along with slots for ventilation. 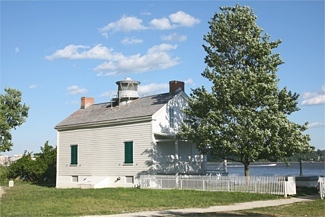 The exterior of the lighthouse was originally painted white, while the protruding lantern was black. 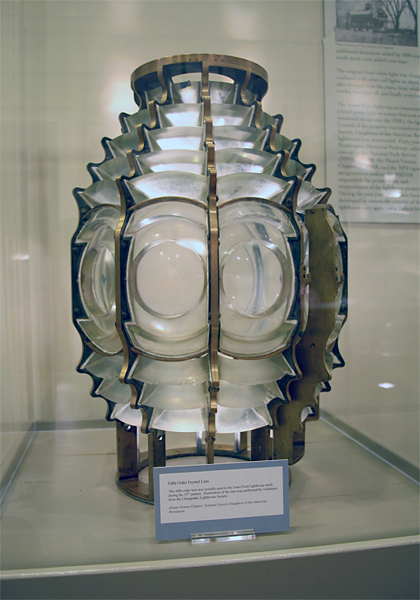 An iron catwalk formerly encircled the lantern room, which housed a fifth-order Fresnel lens that sent forth a light at a focal plane of thirty-five feet. From the beginning, the area surrounding the lighthouse was a gathering place for local residents. During the summer, fishermen, boaters, and picnickers would enjoy the park-like setting, and in colder weather, the beacon’s light, which played upon the frozen river ice, served as an attractive backdrop for ice skating. Less wholesome pursuits also took place in the small buoy shed near the lighthouse, where Maryland rye and Virginia corn whiskeys often accompanied poker games, even during the traumatic years of the Civil War. 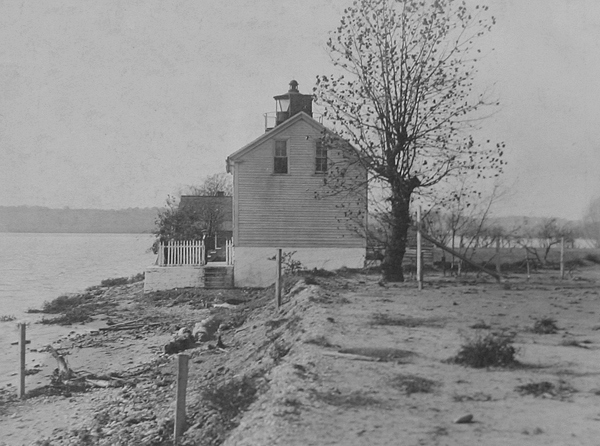 For forty years, Jones Point Lighthouse was home to Benjamin Greenwood and his large family. Keeper Greenwood had four children with Julia Savage, his first wife, and after she passed away in 1873, he married Margaret Grover with whom he had seven more children. Following Keeper Greenwood’s death in 1906, Francis E. Wilkins took charge of the lighthouse. 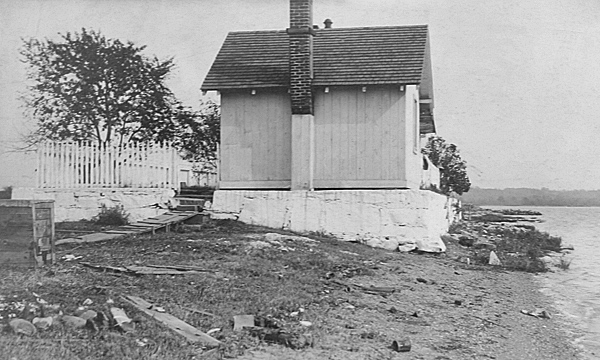 Whale oil lamps were originally used to power the beacon at Jones Point, but in 1858 the Lighthouse Board allowed an Alexandria gas company to extend lines to the station. Soil erosion and corrosion plagued the lines until 1900, when mineral oil replaced gas as the illuminant and the light’s characteristic was changed from fixed white to fixed red. As the lighthouse was near Alexandria’s red-light district, this change caused some confusion to revelers prowling the ‘Moulin Rouge’ corners of the city. The confusion ended in 1919, when the light source was changed to acetylene and its characteristic to flashing white. The Potomac River is the most poorly lighted and marked of the important navigable rivers of the United States, a condition which should not be allowed to continue, because of its relation to the National Capital and many Government activities, and its increased navigational importance. There are urgent requests for steamship companies for improvements in the lighting and marking of the Potomac River. 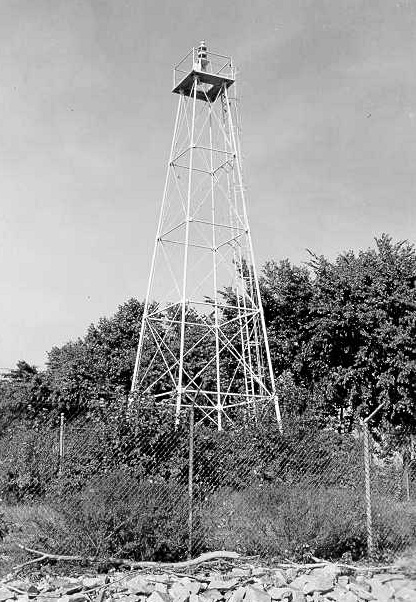 One of the improvements made was to erect a steel skeletal tower on the point east of Jones Point Lighthouse where it would better serve mariners. As the border between Maryland and Virginia was defined as the low-water mark on the Virginia shore of the Potomac River, there was some uncertainty as to who owned the fill which had been added east of the lighthouse. Obtaining title to the land for the new tower “gave rise to interesting and complicated litigation involving riparian owners, the United States, and the States of Virginia and Maryland,” but a clear title to the site finally came from the general assembly of Maryland. The new light, whose focal plane of sixty feet was nearly twice that of the lighthouse, commenced operation in 1926, exhibiting a white flash every six seconds. In 1931, the light was electrified and its characteristic changed to fixed green, and shortly thereafter the light was listed as unwatched. The light atop the tower was decommissioned in 1962, when navigational-aid duties were usurped by the lights of the Woodrow Wilson Bridge. 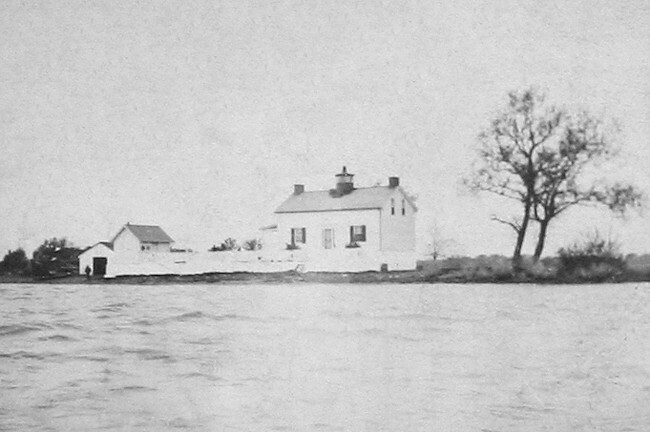 Shortly after being supplanted by the skeletal tower, Jones Point Lighthouse was turned over to the Mount Vernon Chapter of the Daughters of the American Revolution (DAR). The group thoroughly renovated the station and gave it a custodian, a Mrs. McMahan whose ‘Sport Doll Factory’ occupied the grounds for some time. The lighthouse was accessible to the public until 1936, when the Army requisitioned it for a top secret Signal Corps of Engineers project. The grounds were sealed off with a wire fence, and were not returned to DAR until after the conclusion of the Second World War. At that time, the Mount Vernon Chapter found the interior of the lighthouse stripped and ruined, and what remained of the outside walls was pockmarked with bullet holes, compliments of the soldiers who had used the lighthouse for target practice. 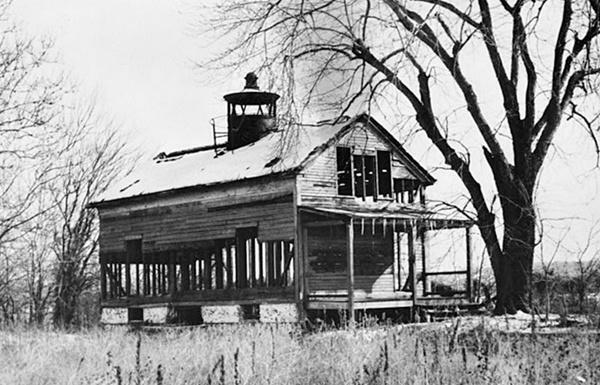 Lacking money for proper upkeep of the lighthouse, DAR turned the structure and surrounding property over to the Department of the Interior in 1964, with the stipulations that the land be converted into a public park and that the group could restore the beacon in the future. In the 1980s, DAR began negotiations with the Interior Department and came away in 1986 with an agreement with the National Park Service that allowed restoration of the lighthouse. During this period, local officials had to fend off the federal government’s efforts to sell the land to real estate developers. Under the direction of DAR, the exterior of the station was refurbished, and the surrounding property turned into a fifty-acre pastoral setting with picnic tables, soccer fields, and bicycle trails. The Mount Vernon Chapter raised $20,000 and received a matching state grant that were used to construct a retaining wall, put up a picket fence around the lighthouse, and replace an interior stairwell. As the last remaining river lighthouse in Virginia, Jones Point is of great historical interest. At a ceremony held June 29, 1995, Leona Kemper, DAR restoration committee chairwoman, threw the switch that reactivated the beacon atop the lighthouse, though the structure’s windows remained boarded up. At the gathering were local dignitaries, park officials, numerous DAR members, and a guest of honor - Louise Evans, the great grand-daughter of keeper Benjamin Greenwood. After hearing a brief history of the lighthouse, the crowd moved back a few paces for a good view of the light as it became a navigational aid for the first time in sixty-nine years. Construction of a new Woodrow Wilson Bridge was completed in 2008, and in 2010 a related two-year beautification project of Jones Point Park began that saw the addition of an athletic field, two basketball courts, a kayak and canoe launch pier, and the restoration of Jones Point Lighthouse. Work at the lighthouse included rebuilding the buoy shed, replacing the porch, and remodeling the interior. Jones Point Park reopened in the summer of 2012, but due to staffing constraints, the interior of the lighthouse is only open for pre-arranged tours. DAR’s twenty-five-year lease on the lighthouse expired in 2012, and it reverted back to the National Park Service. Head Keepers: George L. Deeton (1856 – 1857), J.P. Geisendaffer (1857 – 1861), Benjamin Franklin Greenwood (1866 – 1906), Margaret Greenwood (1906), Francis E. Wilkins (1906 – at least 1917), Amasa J. Simpson ( – 1919), Paul Simpson (1919 – ). The Keeper’s Log, Spring 1994. The Keeper’s Log, Spring 1993. Lighthouses of Virginia, Jerry Zaccaria, 1998. Located in Jones Point Park, just south of the western end of the Woodrow Wilson Bridge. For a larger map of Jones Point Lighthouse, click the lighthouse in the above map. From Interstate 95 in Alexandria on the western side of the Woodrow Wilson Bridge, take exit 1 for Route 1 North. Turn right on Franklin Street and drive six blocks to S. Royal Street. 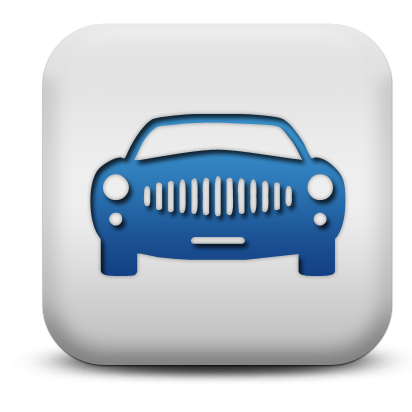 Turn right on S. Royal and drive three blocks to Jones Point Road. Turn left on Jones Point Road and continue to the parking area for Jones Point Park. The lighthouse, which is not open to the public, is located in the southeast corner of the park. 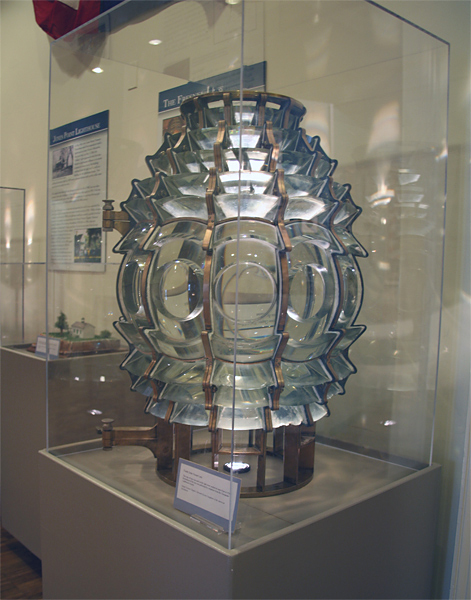 In 2009, a fifth-order Fresnel lens and a fourth-order lens were placed on display at the Lyceum in Alexandria. 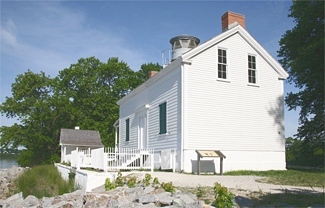 While a fifth-order lens was used in Jones Point Lighthouse, it wasn't the one on display at the museum, as Jones Point had a fixed light. The lighthouse is owned by the National Park Service. Grounds open, lighthouse closed. On April 13, 1921, the Commissioner (George E. Putnam) visited the light station at Jones Point, Va., on the occasion of the celebration of the 130th anniversary of the setting of the initial boundary stone of the District of Columbia by the Daughters of the American Revolution. At their request the Commissioner made a few remarks covering the history of the light station and stated that the Lighthouse Service would be glad to cooperate in any measure to preserve the historical boundary stone and site when it becomes necessary to move the light, as will probably be the case within the next few years. The original southern boundary stone is located on the line of the sea wall, on the south side of the lighthouse reservation and was inclosed therein when the wall was built in 1861. It was originally placed in position with impressive ceremonies on April 15, 1791. In 1911 Fred E. Woodward, of Washington, called attention to its location within the wall and was granted permission to uncover it, but this was not done until 1912, when the U.S. Engineers used the stone for a reference mark in a survey. In restoring the wall it was decided to leave the stone exposed to view as an object of historical interest, and in order to accomplish this it was inclosed in a rectangular concrete cofer built on the line of the wall with an opening on the south side protected by an iron grating, through which the stone can readily be seen. The light at Jones Point was placed in commission in 1855 as a fixed white light. In 1919 it was changed to an unwatched acetylene light showing white flashes.